CSG physicians are committed to developing excellence in clinical services, education and research, which has led to numerous peer reviewed journal publications and presentations. Many of the CSG physicians and other providers are also members and leaders on national quality initiatives. Here’s a closer look at some of their recent outstanding achievements! American Medical Society of Sports Medicine. Awarded Professor Emeritus; effective March 12, 2019.  Poster Presentation at the National Health Policy Conference. “Social Determinants of Health Policy Implementation in Virginia Public Schools”. Nolton EC, Caswell SV, Kerr ZY, Washington, DC Feb 4, 2019. The Sylvan E Stool Memorial Lecturer at the University of Colorado School of Medicine on February 6, 2019. Dr. Bryan Carmody was recently interviewed for the “Surviving Medicine” podcast on whether USMLE Step 1 should be changed to pass/fail. Joshua Erickson, MD, Samantha Schrier Vergano, MD, The Hypothermic Newborn. NeoReviews 2019;20;e93. Chmielewski J, Khalsa DD, Carmody JB. Hyperosmolality, high blood pressure, and decreased estimated glomerular filtration rate in U.S. adolescents, NHANES 1999-2012. Nephron 2019 Mar; 19: 1-11. Joel Brenner, MD, Deb Johnson, EDS, Shane Caswell, PhD, Tracy White, MA, BSN, RN. Promoting Student Health: Engaging the Primary Care Practice and School Nurses. Sponsored by the AAP, VDH, DOE and VCU. 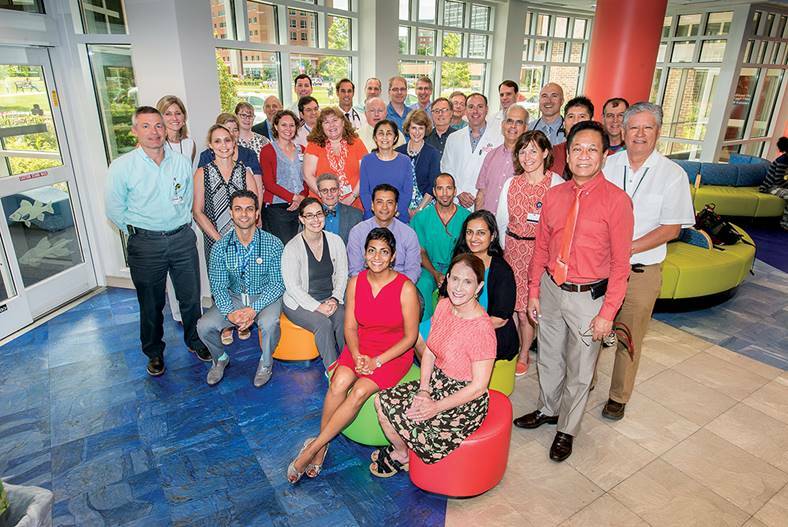 Samantha Vergano, MD, et al. Dr. Cristina Baldassari. “Management of Pediatric Snoring and Mild Obstructive Sleep Apnea in 2018” and “Pediatric OSA Update for 2018”. AAO-HNSF annual meeting October 6-9, 2018, Atlanta, Georgia. Appointed to the ACAAI Expert Panel on Atopic Dermatitis by the executive board. Her job will be to choose grant recipients for 1 million grant dollars intended to study AD with a goal of allergy, derm and PCPs to give same treatment recommendations based on evidence produced from funded studies. This will be in addition to serving as first year regent, annual meeting program regent and as dermatology committee chair. An official Regent on the American College of Allergy, Asthma and Immunology. She was nominated this summer and officially instated at the November ACAAI meeting in Seattle. She will serve 3 years as a Regent with opportunities to advance further after that. She will remain the Vice Chair of the ACAAI.  Recognized at the AAO-HNSF annual meeting October 6-9, 2018 in Atlanta, Georgia for her six years as associate editor for Otolaryngology-Head and Neck Surgery and OTO Open.  Appointed chair of the Young Physicians Section of the American Academy of Otolaryngology Head and Neck Sur-gery for 2018-2019. Keating, D; Marigowda, G, Burr, L; Daines C, Mall, M.; McKone, EF; Ramsey, BW, Rowe; SM, Sass, LA; et al. VX-445-Tezacaftor-Ivacaftor in Patients with Cystic Fibrosis and One or Two Phe508del Alleles. N Engl J Med 2018.007/s40279-018-0950-0. – Attended the International Papillomavirus Society Conference held in Sydney, Australia October 2-6, 2018. He haired the “Head & neck HPV-related disease” session and presented 2 posters “Comparison of specimen collection methods for surveillance of juvenile onset RRP” and “Clinical Update of the Head and Neck”. – Presented “RRP 2018: Update for Otolaryngologists” at the Georgia World Congress Center during the AAO-HNS annual meeting October 6-9, 2018. – Quoted in online magazine Forbes.com article “HPV Vaccine May Reduce Risk of Transmitting Dev-astating Throat Disease in Children” September, 2018. Dr. David H. Darrow will receive the 2018 Otolaryngology Advocacy Award at the Ameri-can Academy of Pediatrics (AAP) National Conference & Exhibition in Orlando, FL, Nov. 2-6, 2018. The award is given by the AAP Section on Otolaryngology-Head and Neck Surgery (SOOHNS) to a member of the Section who has moved the field of pediatric otolaryngology forward. Dr. Craig Derkay has been asked to serve as Pediatric Otolaryngology Section Editor for the American Journal of Otolaryngology. Joel Brenner : DiFiori Jp, Güllich A, Brenner JS, Côté J, Haimline B, Ryan E 3rd, Malina RM. The NBA and Youth Basketball: Recommendations for Promoting a Healthy and Positive Experience. Sports Med. 2018 Sep;48(9):2053-2065. doi: 10.1007/s40279-018-0950-0. Joel Brenner : Interviewed for Time on high school athlete safety. Craig Derkay, MD was elected as Secretary to the AAO-HNSF AMA delegation and serves as the President-elect of the EVMS Faculty Senate to the Department of Pediatrics. “Changes in Transcranial Ultrasound Velocities in Children with Sickle Cell Disease Undergoing Ade-notonsillectomy” was presented at the 2018 annual meeting of the Virginia Society of Otolaryngology-Head and Neck Surgery in Virginia Beach May 18th-19th. Dr. Tina Cunningham also collaborated on the project. “Correlation between Pediatric OSA Severity and Urinary Cotinine Levels” and served as a moderator of a panel discussion “Clinical Controversies in Pediatric ENT”. “When Propranolol Fails in SGH.” European Society of Pediatric Otorhinolaryngology. June 2018. Stock-holm, Sweden. Gary Woods, R. Dharma, S. Creary, S. O’Brien, J. Stanek, K. Hor, J. Young, A Dunn, R. Kumar. Ve-nous thromboembolism in sickle cell disease J Pediatr 2018;197:186-90. Andria Tatem, Rupa Kapoor. Management of Multply Injured Pediatric Trauma Patients in the Emergency Department. Pediatr Emerg Med Pract 2018 Jun: 15(6):1-20. …S. Schrier, Samantha Vergano, et al. Clinical and molecular spectrum of thymidine kinase 2-related mtDNA maintenance defect. Molecular Genetics and Metabolism 124(2018) 124-130. Dr. Reuben Rohn will retire July 15, 2018 after more than 40 years of service in the Division of Endocrinology and as a faculty member of the Department of Pediatrics. Dr. Rohn has been an EVMS faculty member at the rank of Associate Professor from 1982-1989 and promoted to Professor in 1989. He is Academic Director in the Division of Pediatric Endocrinology and has served as Director of Pediatric Endocrinology Adolescent Medicine. Dr. Rohn has served the Medical School and the Department with distinguished service and outstanding dedication. He has served on many EVMS and CHKD committees and has received numerous awards for his service as a pediatrician and educator. Among them are the Donald W. Lewis Achievement Award in 2017, Inside Business Health Care Hero Award, Hampton Roads in 2017 and the EVMS Honoree for 40 years of service in 2016. Quoted in The Virginian-Pilot In article on one of CHKD’s genetics families! Interviewed for USA Today on young athletes and personal trainers.  Description of Hot Debriefings after In-Hospital Cardiac Arrests in an International Pediatric Quali-ty Improvement Collaborative. Resuscitation . Samantha Vergano, MD, Natural history, Surveillance, and Management Recommendations for In-dividuals with Coffin-Siris Syndrome from genotype-phenotype analysis of 81 individuals. American College Medical Genetics Annual Meeting , Charlotte, NC. April, 2018. Dr. Cristina Baldassari – “Management of Recalcitrant OSA after Adenotonsillectomy” at the Chil-dren’s National Pediatric Otolaryngology Fellowship Alumni Scientific Roundtable Presentation and presented “Correlation between Pediatric OSA Severity Urinary Cotinine Levels” as well as “Impact of Montelukast on Quality on Life in Mild Pediatric Sleep Apnea” at the ASPO Surgery and Surgeons of the Future program. Dr. Craig Derkay – “The Benefit of Vaccination on RRP Incidence and Treatment” at the Children’s National Pediatric Otolaryngology Fellowship Alumni Scientific Roundtable Presentation and was part of a panel discussion “R.I.P. RRP: What Lies Ahead for Advanced RRP” at the joint session of the American Laryngological Association and the American Brocho Esophagologic Association. Harer MW, Askenazi DJ, Boohaker LJ, Carmody JB, Griffin RL, Guillet R, Selewski DT, Swanson JR, Charlton JR; Neonatal Kidney Collaborative (NKC). Association between early caffeine citrate administration and risk of acute kidney injury in preterm neonates: results from the AWAKEN study. JAMA Pediatrics, 2018 Apr 2: e180322. Sanaz Devlin, MD, Robyn Bockrath, MD, Jean Petershack, MD, Jennifer Trainor, MD, Janice Hanson, MD, Eve Colson, MD and Amal Khidir, MD. Moving Beyond Satisfaction: Developing Meaningful Outcomes. COMSEP, April, 2018. Eric Werner, MD, MMM, FAAP, Chief Medical Quality Officer, Children’s Specialty Group, Children’s Hospital of The King’s Daughters, Inc. Amy Billett, MD, Director of Safety and Quality, Pediatric Hem/Onc, Boston Children’s Hospital. “An Implementation Research Case Study: Innovation in Ambulatory Infection Prevention.” Children’s Hospital Association Quality and Safety meeting in San Diego, March 7, 2018. CHKD congratulates Dr. Theresa Guins for her selection to the board of directors for the Society of Pediatric Urgent Care. Dr. Guins has been a part of this organization since its inception in 2015 and is a strong advocate for the society. She will make an outstanding member and advocate for pediatric urgent cares nationwide as this field continues to grow. Dr. Kent Reifschneider received the HealthCare Hero award 2018. Selected from approximately 100 health care providers nominated by patient/families and awarded based on specific ac-complishments, the measurable impact on the population served as well as exceptional (his recent publications in Diabetes Care 2017 and Journal of Clinical Medicine 2015 ) and unique efforts made by the provider within the community. Samantha Vergano, MD , co-author , Functional Dysregulation of CDC42 Causes Diverse Developmental Phenotypes. The American Journal of Human Genetics 102, 309-320. February 1, 2018. Dr. Tushar Shah – Elected into the Society for Pediatric Research (SPR), Dr. Shah’s election to SPR represents peer recognition of his research achievements in pediatrics. Kent Reifschneider, Karen Rubin, and Stuart A. Weinzimer, “Standardizing Clinically Meaningful Outcome Measures Beyond HbA1c for Type 1 Diabetes: A Consensus Statement of the American Association of Clinical En-docrinologists, the American Association of Diabetes Educators, the American Diabetes Association, the Endocrine Society, JDRF International, the Leona M. and Harry B. Helmsley Charitable Trust, the Pediatric Endocrine Society. Hyperammonemia in Neonates: Looking Beyond Sepsis. Samantha Vergano, MD, Cynthia LeMons. MD. Neonatology Today. 2017;12(12) 15-16.